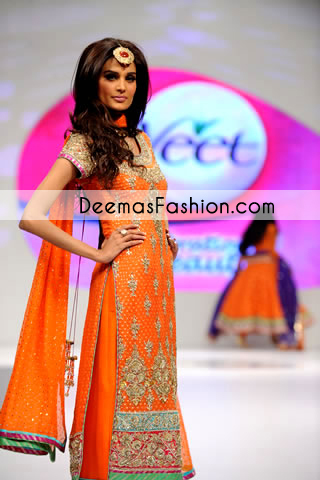 Tags: Banarsi Chiffon, Mehndi Mayon Henna, Orange, Shirt, Straight Trouser. Orange pure banarsi chiffon shirt has embroidered neckline, small motifs all over shirt and large motifs before hemline. Different banarsi fabrics have been appliqued with embroidery on hemline. Same embroidery as on neckline has been implemented on cuff of sleeves. Fully lined shirt with back zip closure. Pure Banarsi chiffon dupatta with banarsi fabrics on edges. Matching Pure raw silk trouser.